McKinsey’s Women Matter research explores the role women play in the global workplace. In this video, McKinsey partners Joanna Barsh, Sandrine Devillard, Emily Lawson and Jin Wang recount the progress women have made in reaching the executive suite. The rise of women to the top positions of political power in their provinces appears set to continue as Sandra Pupatello and Kathleen Wynne took the lead in the race to replace Ontario Premier Dalton McGuinty. Call for Applications! The Cartier Women’s Initiative Award is a business plan competition aimed at supporting creative, financially sustainable and responsible women-led companies, in all countries and industries. Some people seem to do it all. Of course, having a degree in architecture and the experience of an interior designer certainly helps cover some ground. Dee Dee Taylor Eustace, architect, interior designer, business owner, mom, media personality and writer is one of those people who thrive on getting it all done. Maple Leaf Angels (MLA) and CanWIT, a division of CATA Alliance, present investment opportunities in women-led early stage technology companies. A panel of women in technology leaders will kick off the event, followed by an exciting early stage technology company investment opportunity presentation. Successful applicants will be appointed to the Board by the Minister of State (Sport) for terms beginning in the summer of 2013 to manage the affairs and business of the SDRCC. Catalyst Canada will pay tribute to this year’s recipients of The Catalyst Canada Honours, including Top 25 Women of Influence™ 2012 Winner: Jane Allen, Partner & Chief Diversity Officer, Deloitte Canada. Win 2 Tickets to see Margaret Atwood September 17th! Limited Seats Available for OWIT Global Supply Chain Breakfast! The Organization of Women in International Trade (OWIT), Toronto Chapter, presents “Empowering Women in the Global Supply Chain” with Angela Marshall Hofmann, Vice President, Walmart Global Integrated Sourcing and Trade. Congratulations to all the winners from the event May 24 in New York City! Insights and Lessons from Senior Executive Women at the Top by Lisa Heidman, LLB. 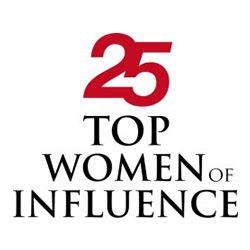 The Top 25 Women of Influence represent the best of the best. These accomplished women are chosen by Women of Influence based on previous recognition, quantifiable data and on their contributions in either Health, NGO, Public, Professional Services or Business fields. Recommend a woman today! Women of Influence President & CEO, Carolyn Lawrence, discusses why women should stop downplaying their strengths and attributing their professional achievements to luck. Thank you to all who attended the Deloitte Women of Influence Luncheon and spent March 8th, International Women’s Day in Toronto, with Sarah Richardson, HGTV host, interior designer, and entrepreneur. Kids & Company: Exclusive National Child Care Provider for Women of Influence. Kids & Company will be offering free childcare services for Women of Influence attendees at their closest location during event times. Thank you to all who attended the Deloitte Women of Influence Luncheon on February 29th, 2012. The feedback from this inspiring event was overwhelmingly supportive and highly engaged! Joey Adler, President & CEO of Diesel Canada Inc.
« Un voyage de mille lieux commence toujours pas un premier pas », et on peut dire que Joey Adler incarne bien ce dicton. A values-driven leader, Broader strives for excellence and mutual respect. Join Shelley Broader on April 26th as she shares the secret behind her lasting success. Join Angela Self, co-founder of Smart Cookies and journalist for The Globe and Mail; and Alison Griffiths, financial journalist and author on International Women’s Day as they share financial trends for you to leverage today, to be a strong woman every day! Sue Lee, SVP, HR & Communications, Suncor Energy Inc.
Find the energy to succeed and the duty to lead with Sue Lee, senior vice president of Human Resources & Communications for Suncor Energy Inc.